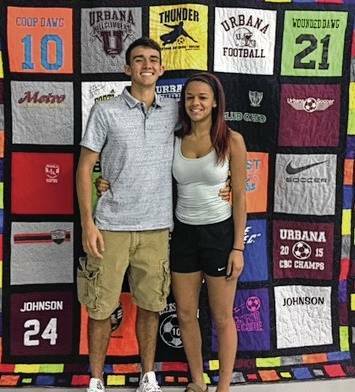 Cooper Johnson, left, Hunter Rogan, right, and Luc Russell (not pictured) are the Urbana High School 2017 Female and Male Co-Athletes of the Year. Rogan in her high school career was selected CBC All- League/District Volleyball 2 years, CBC All-League Basketball and All-Ohio Volleyball. She will attend Ohio University. Johnson in his high school career was selected CBC All-league/District Soccer 4 years, All-Ohio Soccer, set Urbana HS all-time records in soccer (assists) and football (field goal 43 yards). He will attend Ohio Dominican University on a football scholarship. Russell in his high school career was Ohio Individual Bowling Champion, was on State Bowling HS Champion Team (UHS) and lettered in baseball.